For all their pre-match confidence and bravado, TSG 1899 Hoffenheim were simply blown away at Anfield this evening. The Reds head coach, Jürgen Klopp, described Liverpool’s opening 30 minutes as a “thunderstorm”. In short, he was right—TSG had no answer to the Liverpool speed or the way in which they hunted every ball down. Nagelsmann spoke pre-match about TSG’s discipline and patience. Speaking directly to the Futbolgrad Network he said he was “convinced” his side had the patience and discipline required and that they had “shown it on many occasions last season”. The opening few minutes must have filled the young German coach with a mixture of fear and anger. Liverpool had their first sight of goal on four minutes when Sadio Mané broke clear of the Hoffenheim defence but was thwarted at last moment by Oliver Baumann—it was to be the start of a hectic night for the 27-year-old shot stopper. Unsurprisingly with the force and speed Liverpool started with, it was only a matter of time before they registered a goal. Emre Can broke the deadlock on 11 minutes when the lively Mané back heeled the ball to the German international, who steered the ball into an empty net. It was an emphatic start by Liverpool and one which they only went to build upon. By the time the fixture was 20 minutes old, Liverpool had found their third goal of the evening. Emre Can had his second of the night—a beautifully worked goal which saw Liverpool break from their half to hitting the Hoffenheim net in seconds. 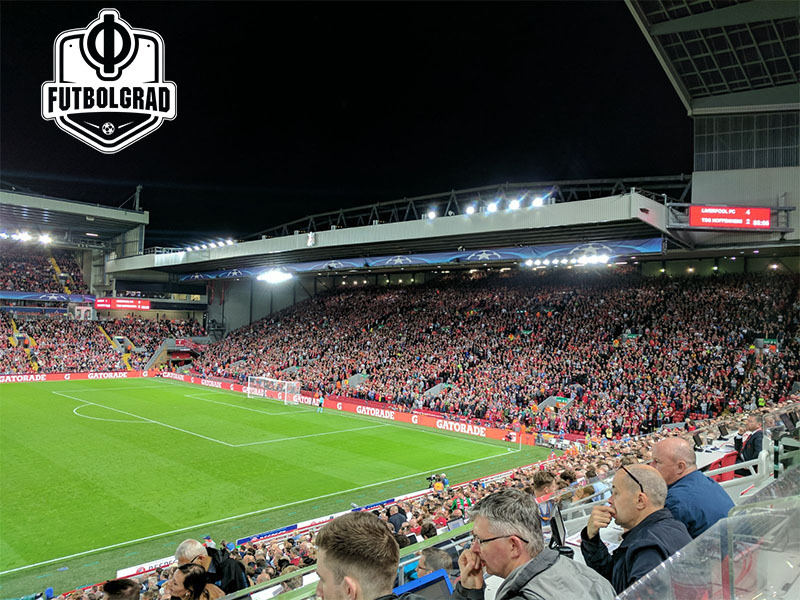 As the ball hit the net, Jürgen Klopp turned to the crowd behind him in Anfield’s Main Stand and barked “this is football, this is football.” Quite simply it was, Can’s second goal coming two minutes after Mo Salah had slotted the ball into an empty net from a rebound off the TSG post. The wheels had come off Nagelsmann’s Champions League wagon before the first half was half way through. Renowned for his tactical thinking, the Hoffenheim coach acted fast. Off came Håvard Nordtveit and on came Mark Uth. Three minutes later the substitute had found the net, driving a low shot across Simon Mignolet he found the corner of the Liverpool goal. It was the reply required, but the tie was essentially over. Uth’s introduction gave a balance to the Hoffenheim side that was missing early on. Nagelsmann had found a quick response, but the patience he was so sure of only 24 hours earlier had failed drastically. When asked post-match if he had made a tactical error by trying to fight Liverpool from the start the 30-year-old responded that the “tactics were excellent, the implementation was off” even going so far as to say that his players didn’t follow the pre-match plan and that they were “intimidated by the atmosphere”, something he dismissed as not a factor only the evening before. To Hoffenheim’s credit they never gave up, even after Roberto Firmino made it 4:1 on the night to Liverpool, the side from Sinsheim kept going. Eventually rewarded with a Sandro Wagner header, the damage had been reduced slightly, 6:3 the final aggregate score. For a side that had taunted Liverpool pre-match the reality was humbling. Kerem Demibay spoke to the press on Tuesday afternoon, telling the waiting journalists he thought the German side played “better football” than their hosts. 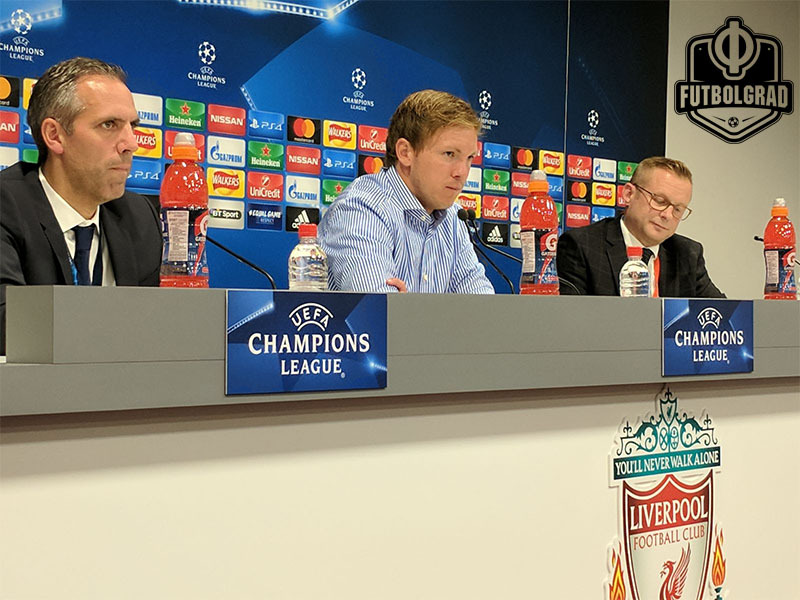 Even Nagelsmann himself dismissed the Anfield atmosphere on Tuesday “I’m not overly awed of this club. We are good enough not to hide here”, fast forward 24 hours and the coach described his players as “headless chickens” intimidated by a loud Anfield crowd. It isn’t all bad news for the club from Sinsheim though. A drop into UEFA’s Europa League will be a good building block for which European experience can be gained. For a side that had never been in European competition before, a seat at the Champions League table will be one to remember. For Nagelsmann, he was not expected to finish fourth last season and in doing so has proven he has the capabilities required to take TSG from the also-ran to the also in contention. Should Hoffenheim grace the Champions League again, it will be after both players and coach have had time to reflect, to build upon experience and also to temper their confidence on the right side of arrogance. As for Jürgen Klopp, he will now take his Liverpool side into Thursday’s group stage draw. A pairing against Borussia Dortmund or RB Leipzig could see the German return to his homeland again, and another set of potentially explosive fixtures.